How reassuring. It looks as if the TV series (and the theatrical premiere, by extension) will at least enjoy a measure of critical success. I don’t expect the “Clone Wars” team to create something that is “Wall*E’s” equal, don’t get me wrong. That’d be unfair, not least from a budget perspective. But at this point, I despair of ever see anything that beautiful, that heartfelt and that moving coming from the “Star Wars” universe. With every new TV and film project, that world is drained of more magic. 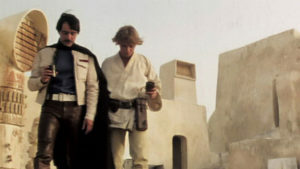 I’ll still probably buy more old-school “Star Wars” gear than I can carry at San Diego Comic-Con in a few weeks. But for this Boba Fett fanatic, the products of George Lucas’ sci-fi empire long ago reached the point of diminishing returns. So there you have it. What exactly will you find when you enter the dark crowded theater this August 15? Only what you take with you.